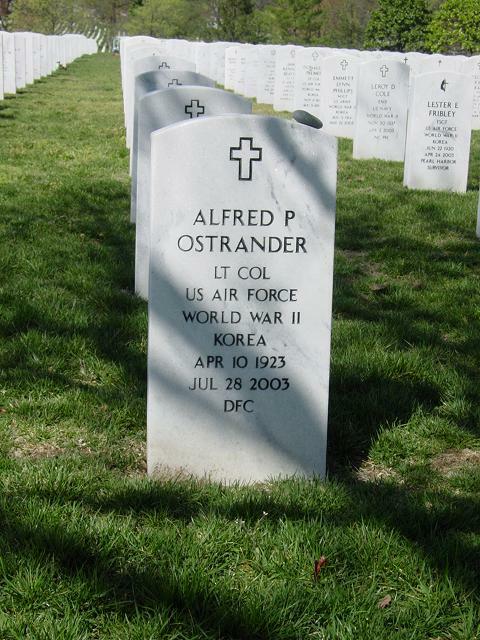 Alfred Peter Ostrander, Lieutentant Colonel, United States Air Force (retired) passed away on Monday, July 28, 2003 at age 80. "Al" was a decorated veteran of both World War II and the Korean War, during which time he was a fighter pilot with the 4th Fighter Group. He retired from the United States Air Force after 21 years of service. Colonel Ostrander was extremely dedicated to his family and although he was humble and unassuming, to all who knew him, he epitomized the true meaning of the word "hero". He was deeply loved and his memory will be cherished. Al is survived by his wife of 54 years, Eleanor "Jean"; his son, Eric Ostrander and wife, Annette of Woodbridge, Virginia; his son, Ronald Ostrander and his wife, Diane of Apopka, Florida; his daughter, Becky Baboyian and husband, Chick of Oakton, Virginia; his grandchildren, Quentin Yeager, Emily Ostrander, Jennifer Ostrander, Elizabeth Ostrander, Molly Ostrander and Jeffrey Ostrander; his brother, Larry Ostrander and his sister, Loretta DeCarlo. Graveside services for family and close friends will be held at Arlington National Cemetery, Thursday, August 21, 2003 at 10 a.m.